By 3E 427, House Hlaalu still governed Seyda Neen, but the Imperial Legion guarded the seaport. Its native population was small, though it was a common stop for Imperial travelers going to and from Vvardenfell. The Grand Pharos was a unique lighthouse at the harbor mouth renowned for guiding mariners throughout the Inner Sea. Most visitors were processed through the Census and Excise Office, part of the Empire's Coastguard station at the harbor. Imperial cutters used the dock as a restocking point to control smugglers and pirates running the waters off the Bitter Coast. 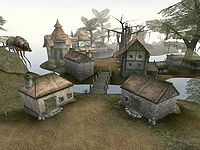 Silt striders provided convenient travel to Gnisis, Balmora, Vivec, and Suran. Wildlife in the surrounding area included cliff racers, scribs, rats, netch and slaughterfish. There were also dreugh not far off shore. Following the Red Year of 4E 5 that devastated Vvardenfell and much of mainland Morrowind, nothing is known of Seyda Neen's fate. As it was located near Vivec City, which received the full brunt of Baar Dau's impact, and settlements across the island were destroyed by the resulting eruption of Red Mountain, it is unlikely Seyda Neen survived the calamity intact.